The nurse in your life will remember how much you appreciate them every time they pull out their keys. 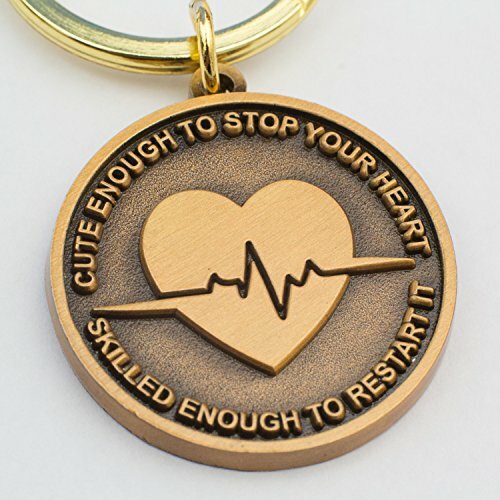 The saying "cute enough to stop your heart, skilled enough to restart it" is emblazoned on the die-stamped medallion, along with an image of a heart and heartbeat. Size: 1 1/4" in diameter x 1/8" thick medallion This premium-quality keychain makes a fantastic gift for the nurse or paramedic (or even doctor!) in your life. The nurse in your life will be reminded of your thoughtfulness and support every time they use their keys. The solid bronze metal is warm in appearance, and you can feel the quality of the stamped medallion. A great way to show support and respect for family or friends who give so much to others. Show them you are proud of them! Suitable for engraving - Take the keychain to your favorite engraving store and have a special message added to this unique gift. If you have any questions about this product by Nurse Gifts, contact us by completing and submitting the form below. If you are looking for a specif part number, please include it with your message.